Botswana is one of the best safari destinations in Africa. On these tours we explore the Okavango Delta, Moremi, Savuti, the Makgadikgadi Salt Pans and of course Chobe. This tour conveniently starts and ends in Johannesburg, South Africa. We also visit the Bushmen tribe in the Kalahari and the world famous Victoria Falls in Zimbabwe. 1. Camping: Clients mostly overnight in comfortable two-man dome tents, with built in mosquito nets and of course a camp bed/ stretcher… and a couple of nights are upgraded to budget rooms. As described below. Our Botswana safari tours depart from the lodge in Johannesburg at 06:30. We set off to cross the Botswana border near Lobatse. On completion of Customs and Immigration formalities we pass through an area boasting significant history, then, it’s out into the vast Kalahari Plains. We will cover quite some distance today before arriving at our established overnight camp near Kang. Once we have set up our camp we will enjoy a short walk out into the bush. Tonight we enjoy a catered meal. After waking early to a spectacular Kalahari sunrise, we enjoy a sumptuous camp breakfast before continuing to the frontier town of Ghanzi. Ghanzi is home to some of the last traditional Bushmen. Our experience will include an educational bush walk led by true Bushmen. This will give us some insight into their daily lives. We learn about their hunting and trapping skills, their peculiar belief systems, and how they find and store their water. We overnight on a vast tract of land owned and managed by the local people. The Okavango is a massive river that spills its contents into the Kalahari sands, creating one of the world’s only true inland delta’s and a unique ecosystem that supports a huge variety of animal and plant life. The sight of a nervous Lechwe (antelope) pounding across a flooded plain, the Jacana (bird) striding delicately amongst the flowering lilies, the Bee Eater (bird) diving to prey on an unsuspecting insect, and of course the familiar cry of the African Fish Eagle - all combine to create one of nature’s masterpieces. We begin our journey into the Delta near the so-called panhandle, gliding through papyrus lined channels, first by motorboat and then by mokoro - the traditional dugout canoe, to our exclusive wild island camp. We spend three nights here in true wilderness, exploring the area on foot and by mokoro. There will also be time to simply relax and to absorb the remoteness and serenity of the area. Starting early, we begin our journey back to "civilisation". We travel by motorboats as we wind our way through the channels of the Delta to where we are reunited with our vehicles. This afternoon we arrive in the ‘tourism capital of Botswana’ - Maun. We will spend some time stocking up on basic supplies before we travel the short distance out to the lodge. Here we can freshen up, or splash in the pool and enjoy a catered meal. The lodge is situated on the banks of the Boteti River. This river changes its flow directions, depending upon the season and rain patterns. The Lodge offers comfortable accommodation, a swimming pool, bar and a restaurant. We enjoy a scrumptious breakfast at the lodge and prepare for the "Safari" part of the trip- surely one of the biggest highlights of the tour. Traveling in our well-equipped 4×4 vehicle we head into true wilderness, passing remote villages along the way. We spend five days in the national parks following seasonal wild animal migrations on extensive morning and afternoon game drives (safaris). There will of course also be some time to relax and to appreciate this rare jewel of a place and its deep tranquility. An example of our route could be: starting with Moremi, we spend the first night near the well-known Third Bridge. Drift off to sleep to the howl of the distant hyena or the earthy roar of a lion, and even the deep grunt of a half-submerged hippo. We then head on north via Xakanaxa to camp near North Gate. This area is excellent for game viewing and we will conduct afternoon and morning drives along the wetland areas. Then up to Savuti! This area offers a multitude of game drive options. Make sure to keep the fruit well hidden from the roving elephant, the meat from the prowling hyenas, and everything from the monkeys. The vegetation is constantly changing from open plains to palm trees and marshland, to dense Mopane woodlands and Acacia scrub, and hence all the fauna and flora changes accordingly. Depending on the conditions in the national parks we might also venture into the Central Kalahari Game Reserve or the Makgadikgadi Pans National Park. During this part of the journey we camp in remote, pristine sites where there is no sign of man’s existence. We will make sure we leave each site in the same condition, nothing but footprints in the sand are left for the quiet winds to deal with. From the last morning in the Parks we slowly game drive our way back to Maun. Here you can enjoy lunch (at own expense) and spend some time before heading out to the comfort of the lodge for the night. This afternoon we will relax at the Lodge before enjoying a catered meal and a comfortable night. Today will have a relaxed start as spend some time enjoying the Lodge and the swimming pool before enjoying Brunch and then venturing eastward and into the spectacular Makgadikgadi Salt Pans. Besides the stark scenery, the Pans are known for their wonderful bird life and some other desert adapted animals. Without disturbing the surface, we make our way to a remote site where we set up camp and take in the isolation and serenity of this expanse. Although we set up tents, we encourage clients to enjoy a night out under the canopy of stars. Venturing north today, we leave the desolation of the Pans behind and make our way up to the mighty Chobe River. The Chobe area is known for the huge herds of Elephants and other animals that are attracted to drink from the River. This afternoon we will enjoy an extensive boat cruise. Gliding close to the banks we hope to be able to approach these animals from the River for close up viewing. After our boat cruise we will cross the border and make our way to the lodge in Victoria Falls. The lodge is centrally situated and within walking distance of The Fall’s and other attractions. Waking up in the adventure capital of Africa, it is with new excitement that we explore the amazing Victoria Falls. The locals call the falls "Mosi o Tunya " - “The smoke that Thunders”. After admiring this wonder of the world, various other attractions can be visited and activities enjoyed , such as the tribal village, the big tree and the curio market. A helicopter flight over the falls or a boat trip on the Zambezi River, White Water Rafting or Bungi Jumping are all worthwhile, but allowance must be made for the extra expense. We spend two nights here to give clients some time to explore Victoria Falls by themselves. Tonight we will eat out in local restaurant (own expense). Relax to the sound of the African night and the distant roar of the Falls and drink the farewell toasts to your adventure. 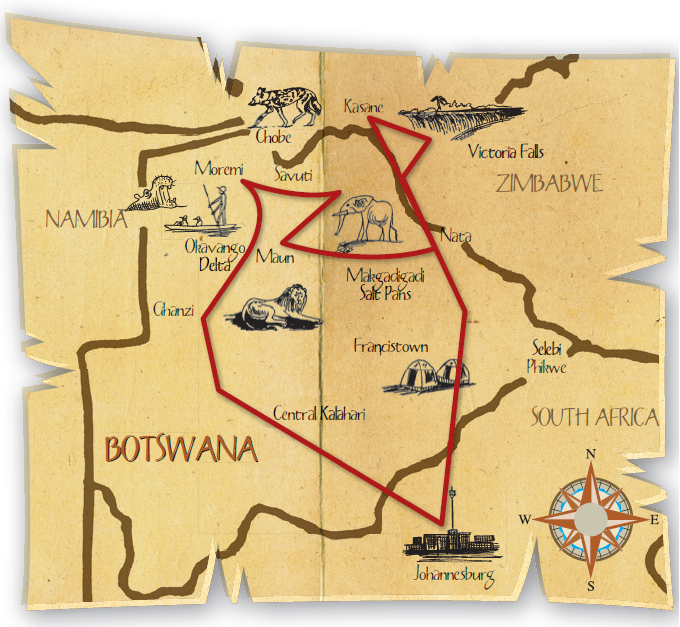 We set off to cross back into Botswana and to continue south toward Francistown. Tonight we will camp for the last time, enjoying the African night and celebrating our adventure over a catered meal. Please note: it is possible to end this tour in Victoria Falls on day 15. Clients can book extra nights in Victoria Falls or they can fly back home (normally via Johannesburg). We cross the Limpopo River back into South Africa and make our way to the lodge in Johannesburg. We should arrive in Johannesburg in the early evening.